We have essentially pencilled in a Nexus tablet debuting at Google I/O next month, but a benchmark that appeared over at Power Board today may have told us much more than we thought we knew. 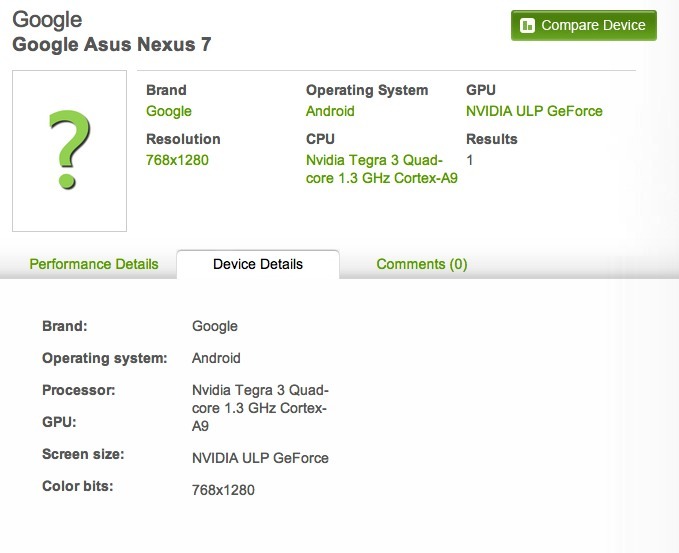 The Tegra 3 is there, but clocked at 1.3GHz. Asus is the manufacturer. The 768×1280 resolution simply screams 7″ display. The name of “Nexus 7” also fits that bill. But what else do we have? Apparently via the app or website, we get some extra details that this benchmark page won’t show you. The OS as “android,” the model name as “Nexus 7,” the hardware codename is “grouper,” the Android build is JRN51B with the “J” signaling Jelly Bean, and the numbering scheme has been updated to Android 4.1. Now we ask this – are you buying this bit of info? Did someone actually screw up and post an early benchmark that just outed Jelly Bean along with the Nexus 7 name? And seriously, is Jelly Bean really ready only 5 or so months after launch? With it being 4.1 and not 5.0, this would lead us to believe that JB is more of an incremental update and not such a massive change like ICS was.